In recent months Heinrich Schweizer and David Roche have departed from Sothebys New York. Schweitzer handled African and Oceanic art while Roche headed up the Native American sales. Roche's new assignment as director of the Heard Museum in Phoenix came as a surprise to many. Considering imminent departures of Indian expert Jim Haas from Bonhams and the future retirement of Doug Deihl within the next five years from Skinner's Ethnographic sales, one wonders what is happening in the public sector for tribal art sales in the United States. In my judgment Paris has just become more important which considering additional shipping and handling costs and the hassles of dealing with an increasingly complex customs gauntlet, this is not good news. In general both Sothebys and Christies have cut staff to minimize costs in a sluggish art market. As sellers and buyers the challenges remain the same as they have in recent years. There are great opportunities on the buy side with more care required on the sell side. 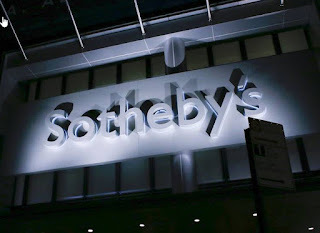 1.NEW YORK The world-famous art auctioneer Sotheby’s suffered an $11.2m (£8.1m) loss in the fourth quarter of last year, warning on Friday of difficult months to come as the art market enters a slowdown. The salesroom, which reported a profit of $74m over the same period a year ago, warned that commissions from auctions – its largest source of income – fell 8% to $284.4m in the final three months of the year. Total revenue dropped from $351m to $335m. Sotheby’s blamed a slowdown in fine arts sales in Asia. The auctioneer has experienced executive suite defections and firings over the past two years, after activist investor Dan Loeb demanded the company return more cash to shareholders. It announced further staff defections on Friday. Alex Rotter, global co-head of contemporary art, is leaving after 16 years. David Norman, vice-chairman of Sotheby’s Americas and co-chairman of impressionist and modern art worldwide, is to leave after 31 years. Their exit marks a broad exodus of established art expertise as Sotheby’s attempts to compete with arch-rival Christie’s aggressive penetration of Asian markets. Anthony Grant, international senior specialist in contemporary art, left in January. Melanie Clore, chairman in Europe and co-chairman of impressionist and modern art worldwide, resigned a month later.